Although these two bridges are half a World apart (about 10,700 km - 6630 miles), it is a quirk of coincidence that both of these were built in 1936 and have almost the same design. 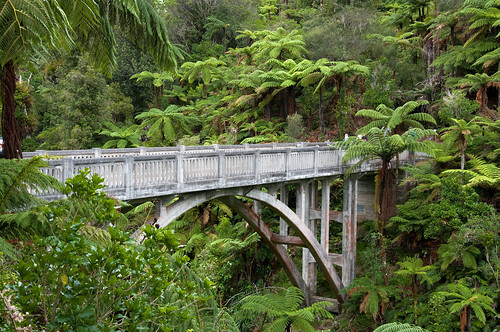 The 'Bridge to Nowhere' is a concrete arch bridge spanning the Mangapurua Stream in Whanganui National Park, North Island, New Zealand. 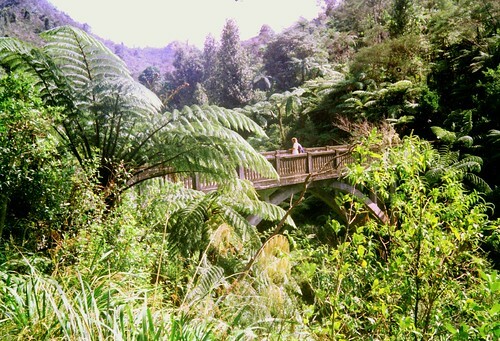 This 130 feet (~39.62 metres) long 125 feet (~38.1 metres) high bridge was completed in 1936 to provided access to the settlers across the Mangapurua valley. The valley was first opened in 1917 when soldiers returning from World War I were settled there by the Government. However many problems including remoteness and difficulty of access, resulted in large number of families abandoning their farms and finally the entire settlement was officially closed in 1942. With passage of time, erosion due to flooding and non-maintenance, the approach road has gone, however the bridge, which is set in lush green forest, still remains and is now a big tourist attraction, accessible partly through boat and partly by hiking. 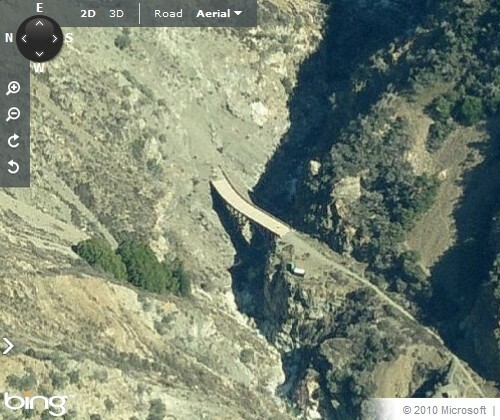 This 'Bridge to Nowhere' located in the San Gabriel Mountains, north of Azusa, California, spans the East Fork of the San Gabriel River. 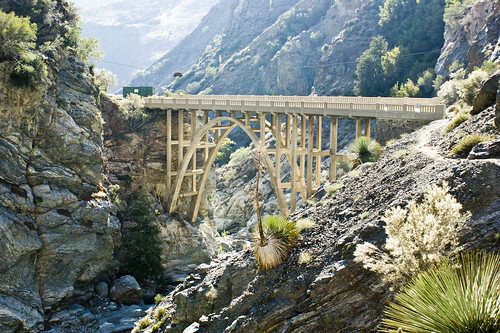 It was built in 1936 as a part of East Fork Road project and was meant to connect the San Gabriel Valley with town of Wrightwood. 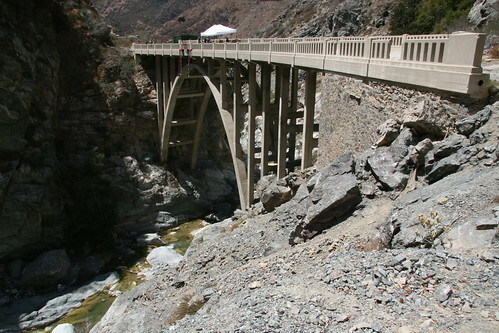 The Great 1938 Flood of Los Angles region, led to rethinking and abandoning of the project, leaving the 37 metre (120 feet) high bridge forever stranded in the wilderness without any connecting road. It is presently accessible through hiking only. Unlike its namesake in New Zealand which is in lush green forest, it is located in a rather desolate area bordering the Mojave Desert. And I think, it will be interesting for my students. Elena Sh. Thank you Elena. I appreciate your comments. Hi there! I just happened upon your bridge to nowhere post. Very interesting post! 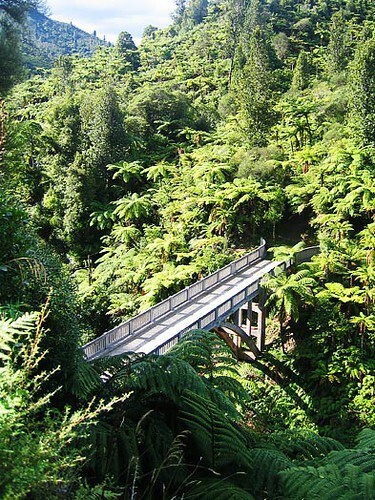 I followed the link to Wikipedia to see if my "bridge to nowhere" was include on their list. I was kind of happy to find out that it wasn't. If you are interest here is a link to what some folks call "the bridge to nowhere" outside of Yuma, Arizona. It starts in a parking lot and ends at nothing. Thank you Pat for this useful piece of info. I will include this bridge in my blog and needless to say will give due credit to you. BTW I am also impressed by your bolg - patricktillett.blogspot.com. It is a good collection of oddities. Well done. Keep it up.